​Excellent food helps your dog stay playful and active, with a polished coat, and an immeasurable appetite. Just like humans, food is a priority when it comes to the dog's general health and activity. Basically, canned dog foods are foods preserved to lengthen their life. Normally, they are sold in different places including online stores. In this article, we have chosen the best 10 canned food for your dog. Further, we have outlined its advantages and disadvantage that will help you when choosing some for your dog. In essence, this is what you need to know before shopping for your dog. 4.1 ​How regular should I feed my dog? 4.2 ​How much food should I give my dog? 4.3 ​How long can canned food stay before getting unfit for consumption? 4.4 ​How do I file my dog's food complaint? ​This canned dog food gives preferable amounts of, tasty vegetable, lean protein and very digestible carbohydrates. All these are made to enable maximum absorption of essential nutrients. Consequently, it serves to keep your dog both healthy and fit. ​Ordinarily, the Hill’s Science Diet Wet Dog Food comes prepared with a mixture of foodstuff. They include brown rice, the real meat and a variety of delicious vegetables like carrots and peas. Moreover, the combination is mixed with vibrant gravy which is the reason this wet food becomes tempting to dogs. Notably, it gives high levels of fibrous protein. These are necessary for developing muscle and aiding in maintaining the ideal body condition of your dog. Fundamentally, Hill’s Science Diet is a popular brand which was established in 1939. A science-based procedure is used to come up with an extensive range of foods to fit dogs of entire sizes and life stages. Notably, the nutrients and Ingredients are keenly chosen to give the maximum stability for your dog. Moreover, each serving has 23 essential vitamins and minerals to help boost your dog's general wellness and health. With the fact that this is a budget alternative, it contains meat by-products and flavoring. ​Sometimes, your dog's preference and his response to some food may determine what you will buy for them. If your dog prefers a grain free meal then this is the right one for you to purchase. It is really nice for grain sensitive dogs. Besides, there are some superb grain free canned dog menus available. 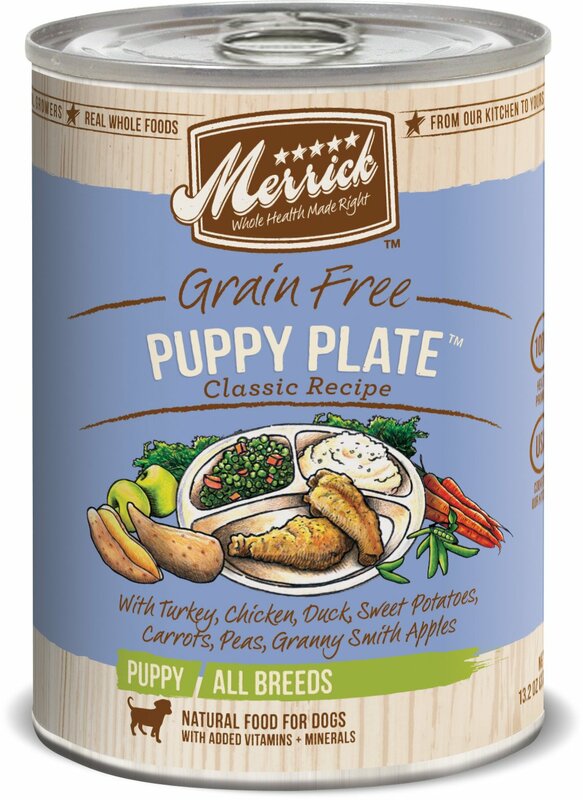 Truly, with this Merrick Classic Grain-Free Canned Food as one of the best. Fortunately, it is available in an immense range of eleven flavors comprising particular blends for puppies. Every flavor of the Merrick Classic Grain-Free Dog Food has meat as the priority ingredient. Furthermore, this is blended with some vegetables and fruits. This includes apples, potatoes and beans. ​Did you know that it is essential to give your dog food that goes with his age? In fact, as your dog ages, it becomes prudent to consider changing to canned food for elder dogs. If your dog is well grown, the Wellness Complete Health Natural Wet Dog Food is what you need. Really, this canned food is made to sustain the 5 signs of wellness found in senior dogs. These signs include digestive health, coat and skin, immunity, energy, teeth and gums, and eyes. It has flaxseed to for a healthy coat and skin and carrots which are a good source of antioxidants. ​Comparably, the Blue Homestyle Recipe Senior Wet Dog Food is another dog food for senior dogs. It has deboned chicken mixed with healthful brown rice and the barley whole grains. More so, it has sweet potatoes, carrots, cranberries and blueberries. All of these help render this dog food quite palatable. Another eye-catching feature of the Blue Homestyle Recipe Senior Wet Dog Food is the natural ingredients in it. Certainly, these ingredients provide your dog with high-grade complex carbohydrates and proteins. Luckily, the two ingredients are exactly what your dogs really need to remain healthy and active all the time. 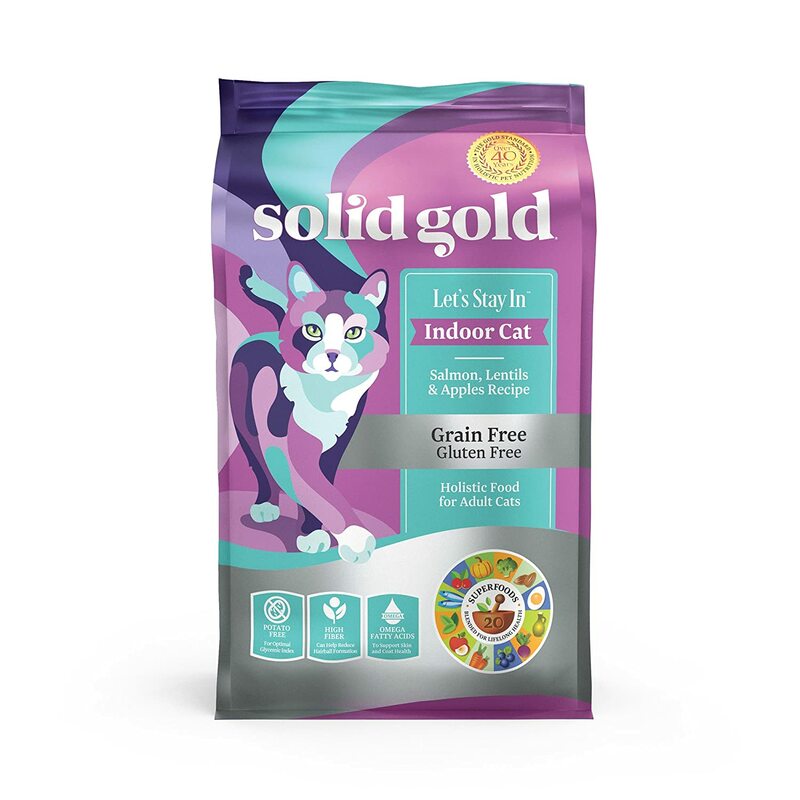 ​Solid Gold Let’s Stay is a grain-free recipe. Typically, that is good in managing the weight of your grown dog. From our view, the food appears to be selectively made blend. Actually, it comprises of nutrient-rich superfoods that give the excellent source of minerals and vitamins to make your dog feel good. Indeed, this food has high fiber. Accordingly, we recommend it if you have a dog with digestion challenges. Further, it will be importance if you want to avoid unforeseen digestion issues. As a matter of fact, there are some components that make this good for digestion. They include ​Salmon, Lentils & Apples that are very rich in fiber. ​The Blue Buffalo Wilderness canned food is another grain-free dog food made particularly for puppies. Really, it is one of the greatest that has everything it takes to appear in our top 10 list. First, the Blue Buffalo Wilderness canned food has the fatty acid DHA that is normally available in mother's milk. Normally, the component is quite essential for cognitive learning in your puppy. In addition to that, it also has a high level of protein that is great for the growth of a puppy. Furthermore, this food has no artificial preservatives and flavors. Another distinctive and amazing feature is that it is made without wheat, unlike the other wet dog foods. ​Actually, the great protein amounts of proteins found in this food benefits your dog. This is particularly when it comes to maintaining fibrous muscle mass not necessarily putting on weight. Similarly, the balance of nutrients is intended to assist and support the immune system of your dog’s too. This Management Canned Dog Food is made with actual Turkey and other kinds of high-grade Ingredients. Compared with similar dog food, the Purina Pro Plan Focus Weight Management is the best. This is because it has 25 per cent lesser fat and that making it even better for your dog. ​Literally, this is a low fat and calories weight management canned dog food made by Pedigree. Typically, it is designed to help your dog keep a healthy weight just like the other weight Management Food. What is unique about this food; however, is its hearty texture. Additionally, the highly absorbable ingredients provide a perfect nutrition for any dog. If your dog is always picky and selective when it comes to canned food worry no more. Definitely, it is time you should try the Pedigree Weight Management Adult Wet Dog Food. Actually, the taste of the beef in this food is quite irresistible and your dog will certainly love it. ​Like humans, dogs also have preferences. Because there is no specific protein source that is better, it is good to consider the preference of your dog. ​Indicators that your dog be allergic to some food include diarrhea, itchy skin and gassiness. In case you observe one of these signs then it is time you change the type of canned food. Otherwise, if you do not think your dog has an allergy issue, he is certainly fine. ​​The picks in this article are readily obtainable online. However, some firms just have them in specialty stores or distribute them regionally. Therefore, you need to choose where to buy them depending on your convenience. Regardless of how your budget appears, just stick to it. In case you are prepared and able and wish to splurge for the most costly dry food, just go for it. Nevertheless, if you like spending less on the cheapest food, still, there is no issue. This is because they also have some valuable nutrients for your dog. Again, you don’t have to feel compelled to purchase very costly food to become a number one dog parent. After a thorough ingredient analysis and proficient consultations, we have come up with these 10 canned dog foods. They are all top-quality food for any dog breed. However, it is the owner's responsibility to know their dog's suitable food. In case of any concern, seeking your vet's advice and clarification would be prudent. ​How regular should I feed my dog? ​All dog meal descriptions are included in feeding instructions. With that in mind, these outline the preferred amount of food per day as per your dog's weight. Give your dog approximately two times a day at an interval of 8 to 12 hours. ​How much food should I give my dog? ​Normally, your dog's lifestyle and metabolism will determine how regular you should feed it. Besides the feeding instructions given on food stamps, there other things to you should remember. Consider your dog's energy levels and body shape to determine how much meals he requires to remain active and trim. ​How long can canned food stay before getting unfit for consumption? ​Usually, wet food need not be left out for more than 30 minutes. In addition to that, ensure food bowls are cleaned regularly regardless of the food type. ​How do I file my dog's food complaint? ​Actually, you can report concerns or complaints regarding any commercial pet (including your dog) via the FDA. Normally, this will review if sufficient complaints are addressed to the same firm. Likewise, you can reach a manufacturer instantly, via the toll-free client inquiry number put on the commodity label.